If it's a race you want, then nothing is faster than the F1 track! Race around the circular track in this speedster and brake at the pit stop for just a second to get recharged and ready to go. Have you ever seen those guys rush around the car? It's more exciting than the actual race. Use your Arrow Keys to drive around the track. Little Bear is a cutie that likes to gear up and go toe to toe with the big boys and their big toys in this fun game of avoiding the obstacles and smashing the other racers off the road! Compete with other raccoons as you race your kart or hovercraft through 8 different tracks. Blast off into worldwide 3-d racing extreme! Unlock new countries and courses while steering your custom colored supped up mega buggy to victory! 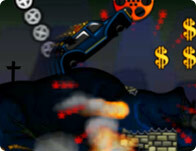 A 3D flash racing game. Select your car and race on these great tracks. You need to place 1st to unlock the next track. Submit your scores and have fun. Race some sad looking horses. Balance your Orc racer as you run over knights, orcs, sheep, and pigs. Keep balanced and don't tip!